Can't get better......infact da best Awesome work Richard !! Thanks everyone & yes you'd better hurry.. I like the idea of transparency... They are (to my opinion) the most useful widgets you can have as they blend in with any skin in Windowblinds. And seeing that I'm an ObjectBar freak!, they are very useful on my ObjectBar sidebar. Keeping transparency in mind, I would like to have all the individual widgets: clock, calendar, email checker, weather, days countdowner, calculator, recycle bin, media player, ram meter. I guess that's the standard pack. The other important thing is to have them all the same width as that would streamline my ObjectBar sidebar. It looks a lot better when the widgets are all the same in width. Height can be different. Anyways, your widget is very nice - thank you. I have to say though - my dream is to have the complete collection of transparent widgets. That makes beautiful sidebars in ObjectBar. I really would have liked for Stardock to design and implement the transparency pack and embed it into ObjectBar; and then, when I change my WindowBlind skin, I don't have to change all the widgets so everything can match. 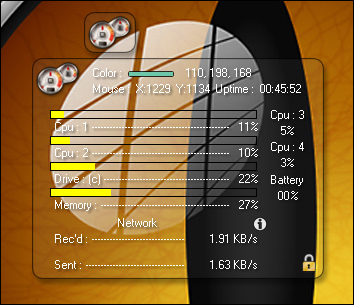 In most cases, widget packs for WindowBlinds themes are never "complete". And so, it gets difficult sometimes to complete the sidebar... but the "transparency" pack would solve this. Thank you..Glad you like them..
Look super nice thanks a lot for that gadget..